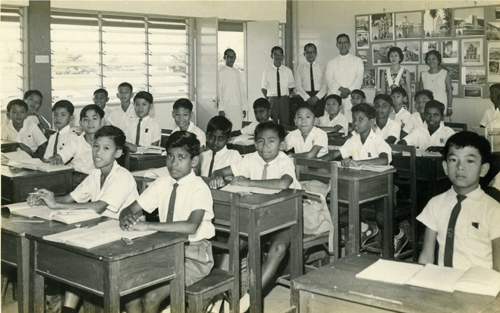 This picture was taken inside an SMI classroom in 1966. It’s clearly marked Standard 5. Also pencilled faintly on the back is David Yee and Soon Yit Tan. We believe those standing at the back, from left ro right are: Bro. Gabriel, Mr. Khoo Kok Hean, Mr. Lim Guan Choe, the 1st Headmaster of SMI Primary School, Bro. Theodoret Michael, Mrs Cheah Hoong Onn. If anyone can confirm these names and add more we would be pleased to hear from you. Such pleasant memory seeing again the faces of my classmates. However, if the year is 1966 by my calculation it should be Std 6 rather than Std 5. Thank you for your kind words. The date and class written on the back in ink is definitely Standard 5, 1966. Would it be possible for you to put names to the faces of your classmates, or at least some of them. Regret that I am unable to recollect the names of my classmates except the one sitting beside me (Kon Si Hon). He is now living in Sydney, Australia. Thanks for that – every little helps, but which one is you please?